I have a question on what is the best probiotic to take in addition to diet.The situation is that I am just on my 3rd round of antivirals for shingles as i have had the rash 3 times in 6 weeks. The doctor has also prescibed me antibiotics as she thinks that the rash off the dermalines is folliculitis but that the shingles has returned (or maybe not gone away). I have been following the clever guts diet since beginning of Jan to kick start and reboot my microbiome as I am also a coeliac and have pernicious aneamia for which i have B12 injections – the last one was 3 weeks ago. I have been havng accupuncture for 5 weeks also and the accupunturist and the doctor have said that my immune system is very low and this has probably been going on a long time. I have a stressful job, i travel and spend 4 hr a day travelling to an from work. I want my body to heal as naturally as possible and i do not want to undo all the good i have been doing with the clever guts diet so any advise on probiotic help will be gratefully received. There seem to be few probiotic supplements that are backed by any research at all. Worse, tests by consumer organisations/ the media have found that some brands do not have anything like the strength (measured by CFUs) on the label. How the product is transported and stored after manufacture is relevant. One of the regulars here (GrahamSPhillips) is a pharmacist and has listed a few brands of probiotics – including VSL3 and Symprove – that have been studied in specific populations. 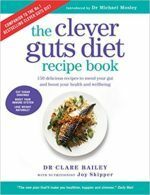 Clever Guts emphasises eating a really wide a variety of live fermented, probiotic rich foods for a really wide variety of species of gut friendly bacteria and yeasts. It is encouraging that, after having their guts flushed out for science, both Dr Michael Mosley and Prof Tim Spector turned to whole and fermented foods, not supplements. I have needed 5 or 6 courses of antibiotics in a year, which has decimated my gut microbiome! I eat a range of traditional aged European cheeses (unpasteurised milk/ blue veined/ mould ripened/ rind washed) PLUS Nexabiotic brand capsules (claims 23 strains, 34.5 billion CFUs). The worst gut symptoms after a course of antibiotics was when I fed the surviving microbes a massive dose of sugar, the best when they got oily fish, vegetables, berries, seeds and so on. Is your gastroenterologist or registered dietician supporting you with Clever Guts, ideally by going through your food and symptom diary regularly? My concern would be how balanced and varied your diet is, given the restrictions of coeliac disease + time pressures + Clever Guts + personal/ family tastes. Probiotics are live microorganisms that are the identical or resembling to microorganisms found logically in the human body. Bacteria normally found in the body execute some jobs, as well as breaking down foods, serving the body to take in nutrients and preventing the take-over of bad bacteria that can be the reason of illness.Probiotics, which sometimes are called good bacteria, are found obviously in some foods, as fine as in over-the-counter supplements in the form of pills, powder or liquids.When consumed, probiotics travel to the intestines and colonize. They are thought to synthesize minerals and produce vitamins and enzymes that help our immune system and keep the intestines healthy. The advice in the book is excellent. Pre and Probiotic foods to feed the good bacteria so, fermented foods (take your pick .. Kefir, Kimchee, kombucha, Sauerkraut) plus prebiotics – a diverse range of foods with the highest amounts of insoluble fibre (to feed the good bugs at the expense of the bad). Its all in the book. As for probiotic supplements – there’s limited evidence for certain specific supplements and specific conditions. What (specifically) are you wanting to achieve? I also tend to recommend INULIN powder – but take it slowly !! In Michaels book “the clever guts diet” it says you advise not to take Probiotics if you have recently had surgery? I’d like to know why not as I thought it would be a good thing to have to help your body recover. I have recently had a Tonsillectomy, Adenoidectomy and Diathermy Turbinates as an Adult and experienced complications at day 10 which was haemorrhaging from the throat area. I had to have further Diathermy done to stop the bleeding. I have been on a 10 course of Antibiotics and wanted to take Probiotics. Should or shouldn’t I do this?? Certain microbes can have positive (probiotic), neutral or negative (pathogenic) effects in different circumstances. Circumstances include the microbes location in (or on) the body, the balance of different microbes present, and the health status of the host individual. Examples of microbes contributing to common health conditions *only in some hosts or some situations* are gastritis (Helicobacter pylori), seborrhoeic dermatitis/ greasy dandruff (Malassezia globosa), gingivitis/ gum disease (Porphyromonas gingivalis), vaginal thrush (Candida albicans). Please consult your medical team about the risks and benefits of a specific probiotic product in your current situation.